Right when I arrived on Santa Cruz island, we set up camp and than left to go on our first hike. We headed up the canyon towards Devils Peak, which is the island's highest point at an elevation of 2450 feet. At the top of ridge, we headed across a flat bluff and wound our way down into smugglers cove on the island's southeastern tip. During this hike Santa Cruz island unique fauna put on a great show. The island is home to the Island Scrub Jay, which is much bigger than its mainline relative. Each island is also home to a unique species of fox. These foxes are extremely cute, but they tend to be aggressive and will come right up to people while attempting to steal food. They were all over our camp and would sneak up whenever we had our backs turned! An island fox raiding out picnic! Download the KML file here to explore this hike in Google Earth! I recently got back from a weekend camping trip on Santa Cruz Island, which is part of the magnificent Channel Islands off of Central California. I went with the UCSB adventure program, which organizes outdoor wilderness trips in and around California and across the country. This program is a great way to get out and see nature while networking with people in the Santa Barbara area. We met at Ventura Harbor at 7 am to catch a ferry out to the island. It was a 25 mile ride across the choppy channel waters, and took a little over 1 hour. Along the way we saw lots of birds and dolphins. At one point, a school of around 100 dolphins were surround the boat, jumping out of the water as we went. It was quite a miraculous sight to see all these creatures. The Santa Barbara Channel is a unusual feature in California geography. The 30 mile wide channel separates the Northern Channel Islands from mainland California. As we left Ventura harbor, the first half of the channel was approximately 90 feet deep. About ten miles into the channel, however, the ocean floor drops off and water depth increases to around 1000 feet in about 1/4 mile! Lots of oil drilling takes place along this drop off, and it attracts ample sea life as well. 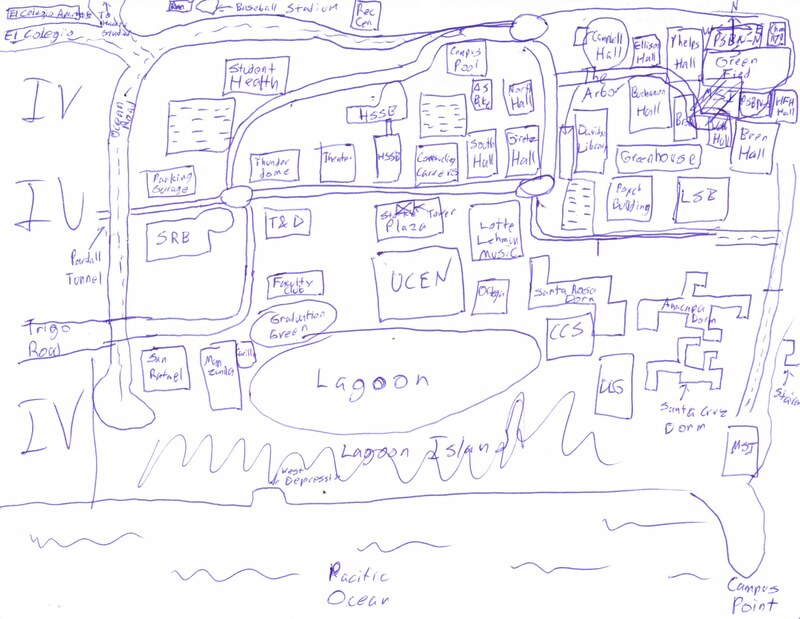 In fact, right around this area was where we encountered our dolphin school! Just made camp - Nice view to wake up to in the morning! Download the KML file to play with in Google Earth! View more photos of the trip! I just returned from a camping trip in the Channel Islands. 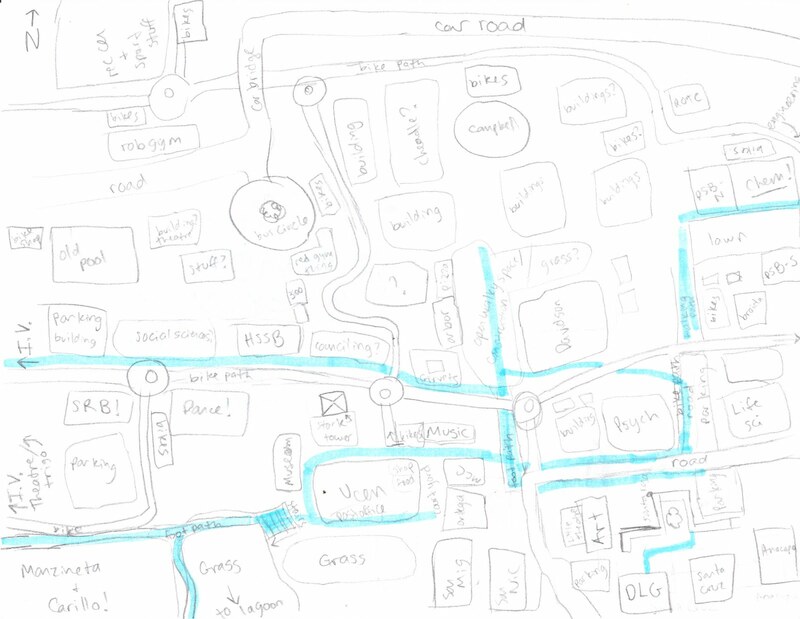 I will be adding maps and pics to the blog over the next couple days, so be sure to check them out! The following is a repost which includes new, higher resolution images. Environmental Cognition and Perception: What does it mean? According to UCSB's Dr. Dan Montello, perception and cognition of one's environment is the process of finding one's way, identifying dangers and resources, and in a more general sense how one's environment is understood. 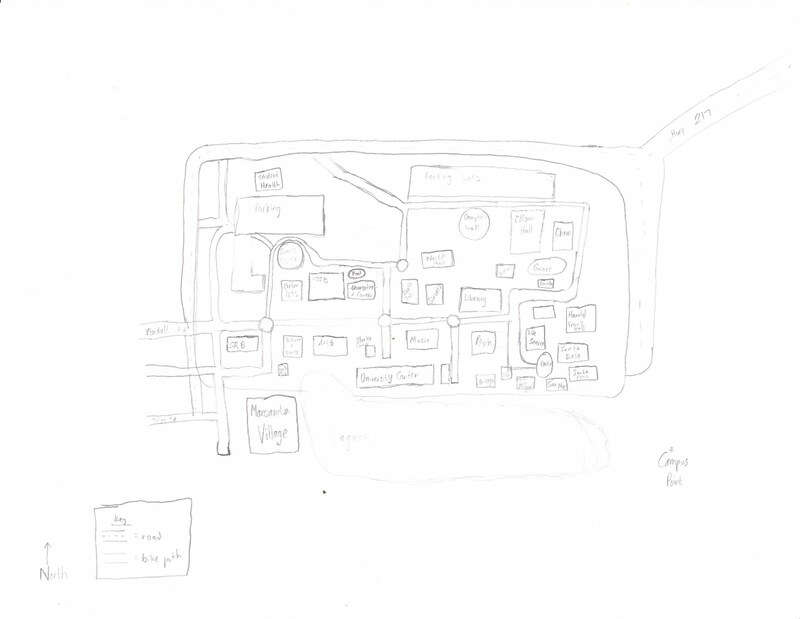 A great demonstration of this concept is the Mental Sketch Map, or a hand drawn map from memory of an area that one is quite familiar with. 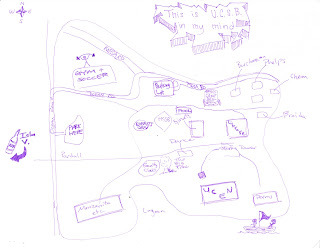 I recently had to collect mental sketch maps from several peers for my Environmental Perception class here at UCSB. 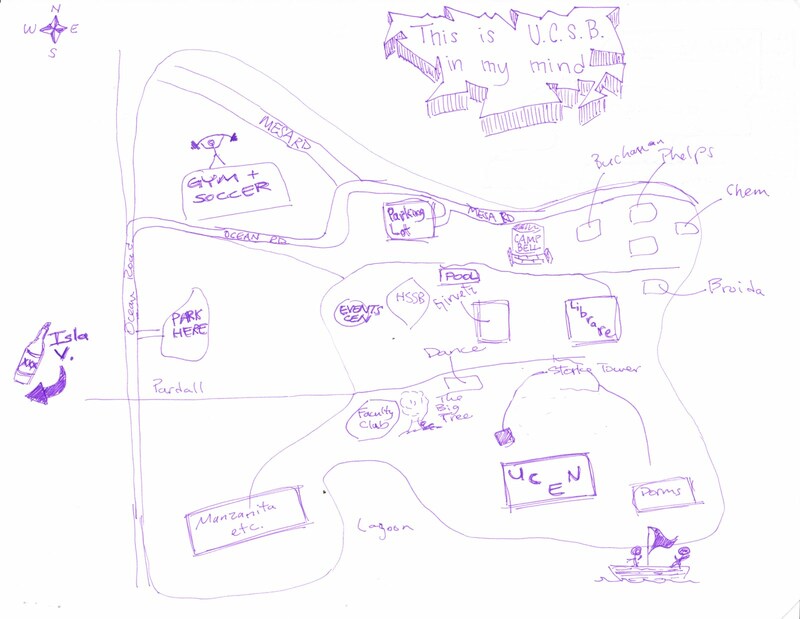 The idea was to see how UCSB students recalled campus and to see how campus was laid out in each other minds. 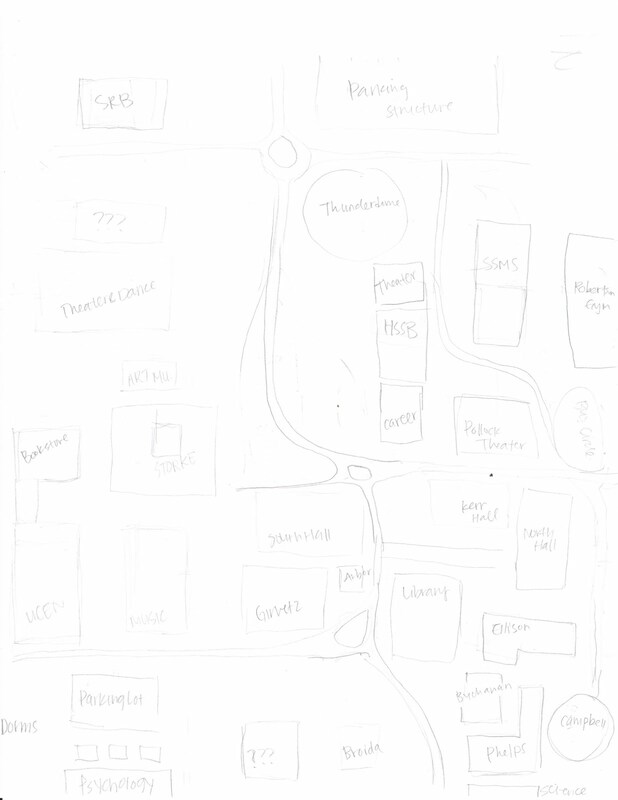 One may be able to navigate around campus quite efficiently, but recalling all that data on a piece of paper at one time is much more difficult. One's mode of transportation greatly affected perception: those who bike always put bike paths down first, and those who walk start with foot paths! 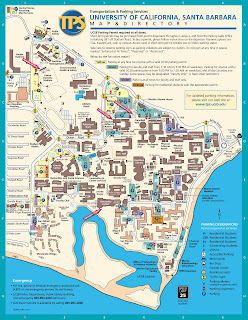 Now: take another look at UCSB's offical campus map. 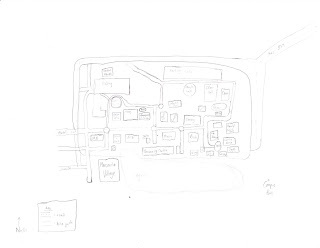 The maps I collected from my participants varied greatly in layout, accuracy, and usefulness, but its extremely interesting to see how people perceive their surroundings. 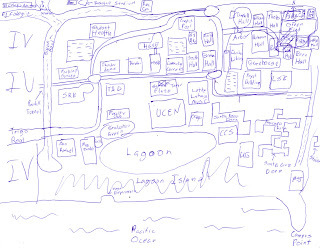 UCSB's interactive campus map is an amazing tool for any student of faculty memeber, and demonstrates that the geography department here at UCSB is on the cutting edge of GIS implementation. This map was created by UC professors and students around five years ago, and layers are continually added and fleshed out with more precise data. 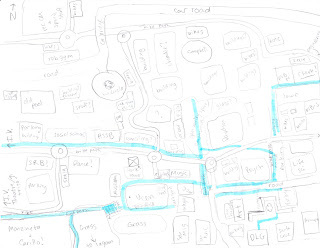 Parking is complicated! 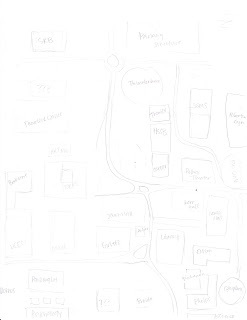 Let the interactive campus map help you out! Wifi strength.. Red is good. 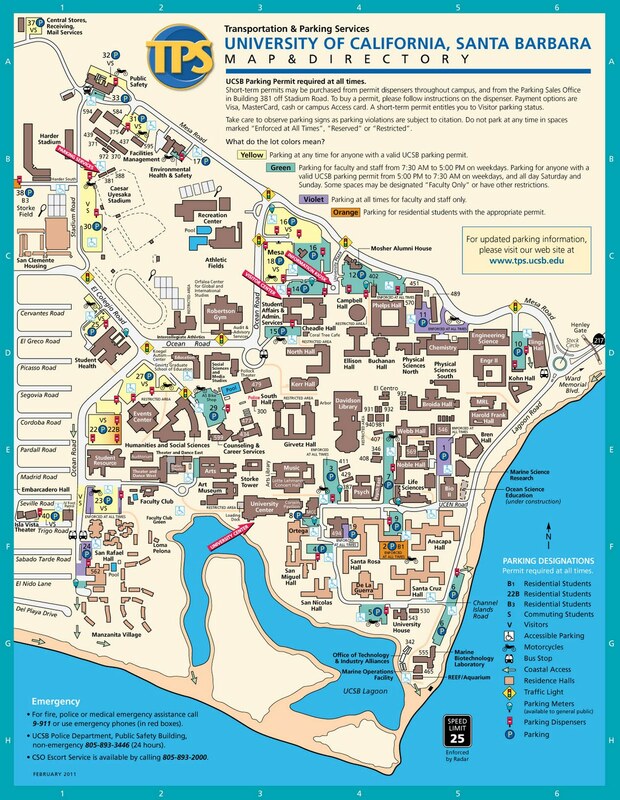 Special thanks to UCSB's Department of Geograpphy for this amazing project!